by Bill Dwight on Friday, March 16, 2012 at 5:50 PM | LEAVE A COMMENT! aggressive matching incentives from Dad to encourage saving. 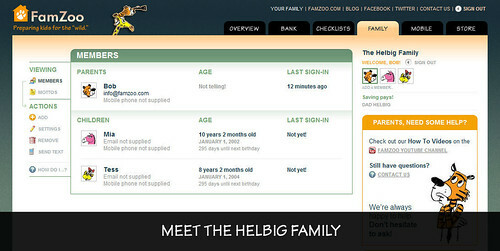 Since being able to customize your virtual family bank is one of our hallmarks, we decided to put FamZoo to the test: could we faithfully represent the “Bank of Helbig”? Yep. 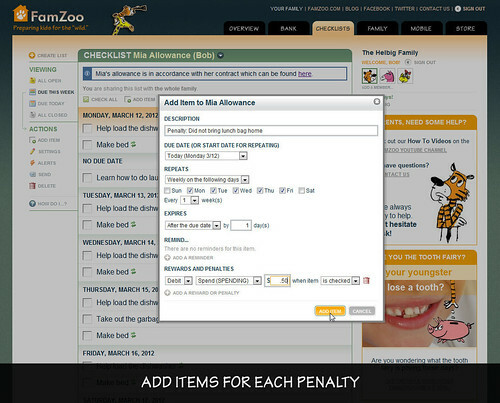 Here are the step-by-step instructions for how we took the rules described in Bob’s system and brought them to life in FamZoo. The first order of business is to register the family. Here’s the Family tab after filling out the three short forms to register Bob and add his two daughters. We also picked some suitable avatars for each family member and added Bob’s touch-phrase from the end of his column — “Savings pays!” — as a family motto. Check out the top section in the right sidebar. Click to see larger size in separate window. To encourage savings, Mia Rose Helbig and Teresa Violet Helbig will be able to choose how much of their allowance they keep each week and how much will go into their savings accounts. So, we’ll need two accounts for each daughter: one for the “keep” portion (which I take to mean spending) and one for savings. 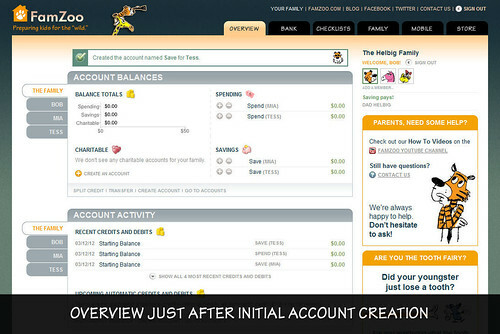 We create each by clicking on a Create Account link (which you can find on either the Overview or the Bank tab) and filling out the form. 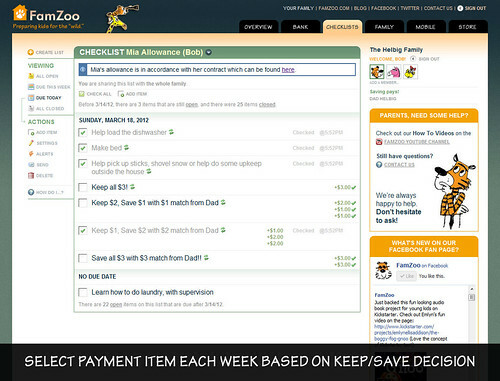 Each will earn $3 weekly if they fulfill all conditions spelled out in their respective allowance contracts. Peeking at the contract, we see the conditions include a set of expected daily and weekly chores. 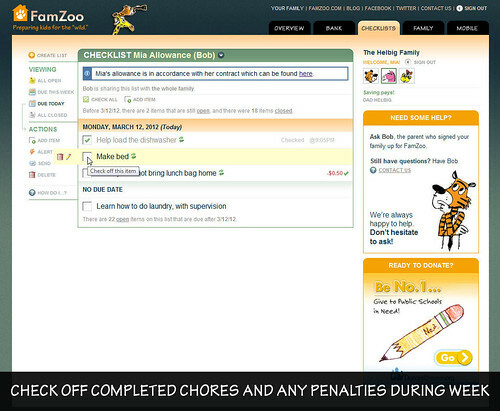 Those can be captured in a FamZoo checklist. 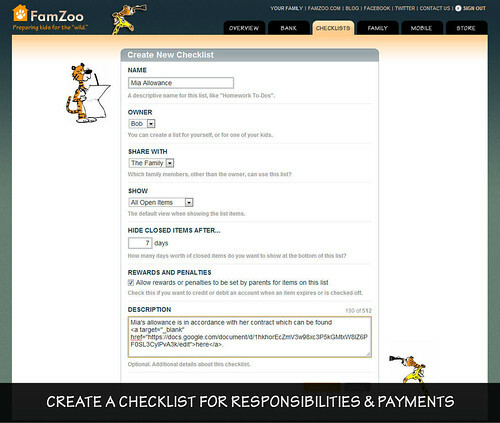 So, we go to the Checklist tab, click the link to create a new checklist, and fill in the form to get started. We’ll do this once for each daughter, calling one “Mia Allowance” and the other “Tess Allowance”. Now that we have the (initially empty) checklists for Mia and Tess created, we can start filling them in with the expected chores for each daughter. 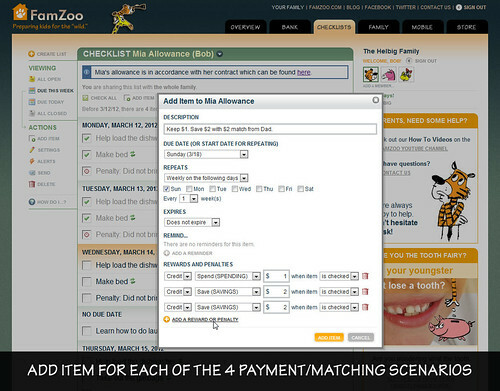 Just click the Add Item link and fill in the options to match each chore name and frequency specified in the matching allowance contract. For example, here’s the Add Item dialog filled in for Mia’s weekly “Vacuum the living room” chore that we’ll assume happens every Saturday. It is Mia’s responsibility to bring her lunch bag home every day. Failure to do so will result in a penalty of 50 cents being deducted from her allowance for each day she does not bring it home. We can represent this clause in Mia’s contract with a checklist item repeating every weekday that debits her spending account 50 cents whenever it is checked off. 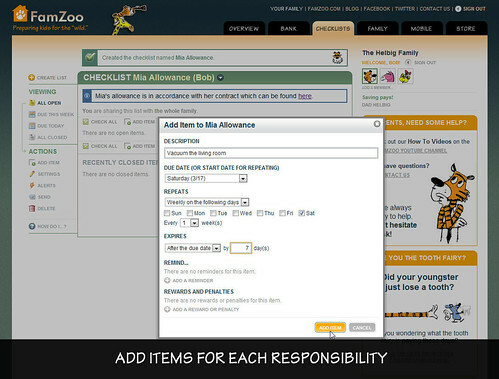 Here’s how we fill in the Add Item dialog to make that happen. Each week, each girl will decide how much of their allowance they will receive in cash and how much she will save. For every dollar they choose to NOT receive in cash, but designate for savings, it will be matched by an equal amount to be deposited in their savings accounts. 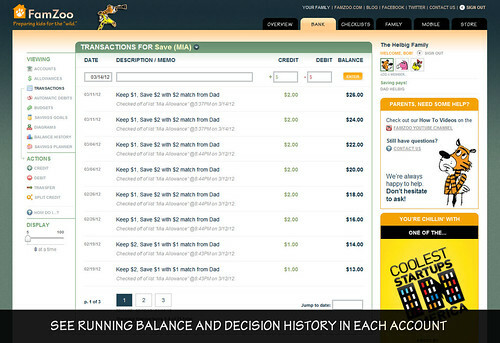 All decisions on how much to keep and how much to save must be made in whole dollar amounts (no fractional amounts). Our older daughter, 10, who tends to want cash on hand, so far this year has earned $27, kept $16 and chosen to save $11, meaning she’s benefited from $22 deposited in her savings account. Whaddya Think? Ready to Start Your Own? 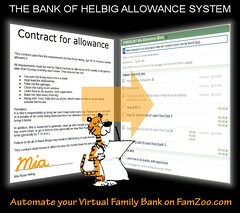 So those are the allowance and chore rules in the Helbig family, and that’s what it takes to automate their system in FamZoo. What do you think of the Helbig approach? 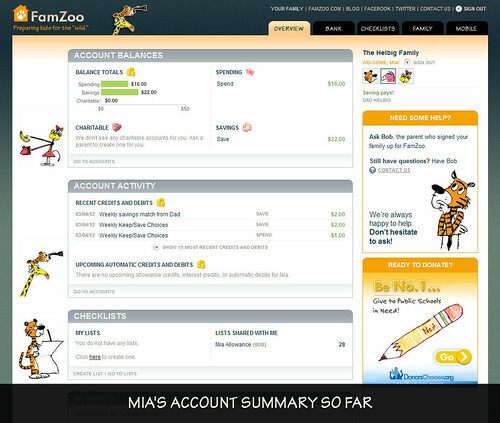 How does it compare to your allowance and/or chore system? Share your thoughts in the comments. 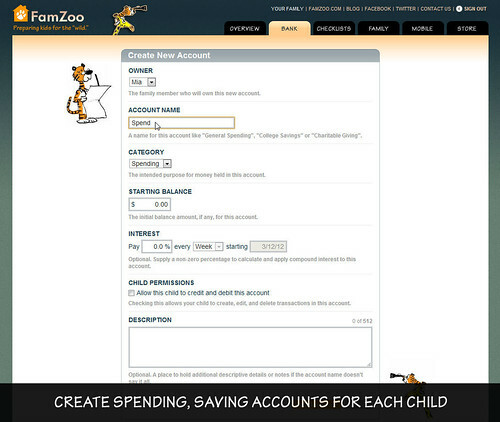 Ready to set up your own virtual family bank system in FamZoo? Register here. Need help getting things configured just right? We’re always happy to help. Contact us.